Zimbra Collaboration Suite is an open source email and collaboration platform that includes email, contacts, calendar, documents and more. It is a Web-based application suite that can be deployed as an on-premise private cloud or outsourced public cloud service. I’ve been using Zimbra since 2007 (version 4.x) for variety scale of implementation : from hundreds to fifty thousand account. How this can be handled by Zimbra? The key is to use Zimbra cluster with multi-server scheme. Below are simple Zimbra design with 1 main goal : be able handle up to 25 thousand accounts. Allows us to create a different rule for incoming and outgoing email, ie : rate limit outgoing email to prevent blacklist IP when compromised account send massive spam email. Applying such rule will not affecting local mail delivery. I know that the above design are very modest and based on my experience only, so if you have any suggestion regarding Zimbra large scale deployment, do not hesitate to drop a comment. I will use always a MMR to protect the critical part of the Zimbra environment, LDAP, maybe just 2. I always want to add Proxy, 2 or more depending of the Users. Have an interna DNS is important, with a NTP server as well, then all servers with NTP client. If you are using NE, have a dedicated convertd server, not required in all and each server, depends of the use of the High Fidelity Preview. the dnscache service in the MTA is always welcome as well. All of the rest is amazing! Carefully install for productive Zimbra server MMR server, according to the official description of MMR installation from Zimbra, because it only works in with one, default domain Zimbra installation. If you have multiple domains, all domain users and domain erase the MMR and also from the productive server too! for use with fifty thousand accounts, what is system configuration? Processing capacity of each server if I use the physical server? 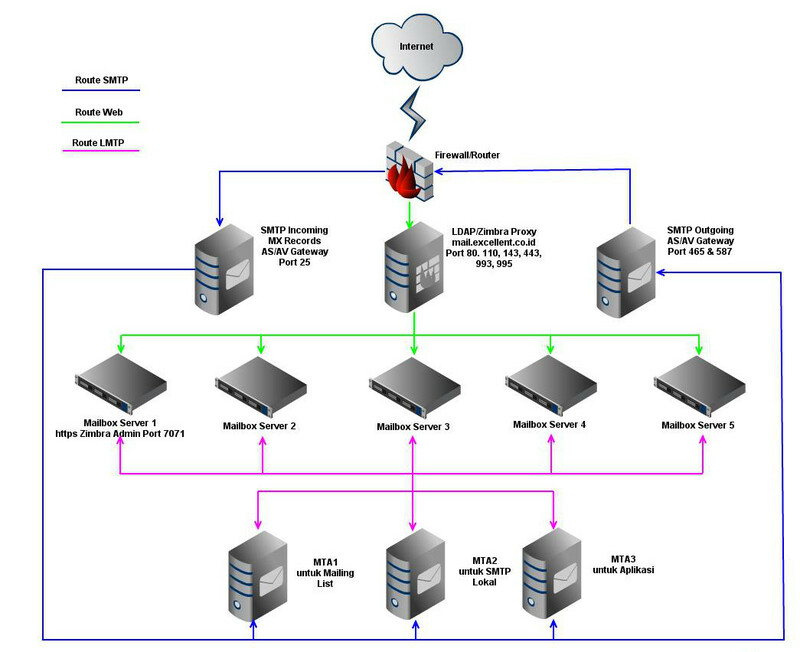 For use of 1500 mailbox what should be the best configuration along with hardware in VMware enviroment. If you kindly share hardware specification Concerning RAM for each virtual mailbox server covering 3000 users as you have mentioned. Secondly, can it be possible on Zimbra Open Source Edition? It is said that only one public IP is required that is assigned to webmail.vavai.com that is NATted to mailbox servers I think so. How about the Incoming MX record which also requires a public IP. Can you please clarify me.. It is said that only one public IP is necessary that is assigned to MTA host. How the external users access their mboxes reside on mailbox hosts which also require public hostname. Can you please clarify me how external users connect to mailboxes. Hi Vavai: I enjoyed your blog. Questions about multiple domain hosting. Is it possible to have virtual domain A route to vda.vavai.com and virtual domain B route to vdb.vavai.com and virtual domain C route to vdc.vavai.com etc. etc. etc. ?